The Personal Representatives of the late W.E.Bruges invite tenders for an Option to Purchase the above site for residential development. From Trowbridge take the A361 Devizes Road for about 2 miles. At the large roundabout turn left into the village of Semington. Pound Lane is then the third turning on the left. The site is to be found on the right hand side, towards the end of the lane. The site occupies a pleasant semi-rural location on the edge of the thriving village of Semington, with open fields and the Kennet and Avon Canal to one side. Local village amenities include Post Office, Junior School, Public House and Church. The nearby towns of Trowbridge and Melksham, each within 2 1/2 miles offer an excellent range of shopping, educational and sporting amenities. Other towns within easy reach include Devizes (7 miles), Westbury (8 miles) and the city of Bath (15 miles). The M4 (Junction 17) is just North of Chippenham (10 miles) and there is a high speed train service to London Paddington from Westbury station. Sandford House, Kingsclere, Newbury, Berks. RG20 4PA. 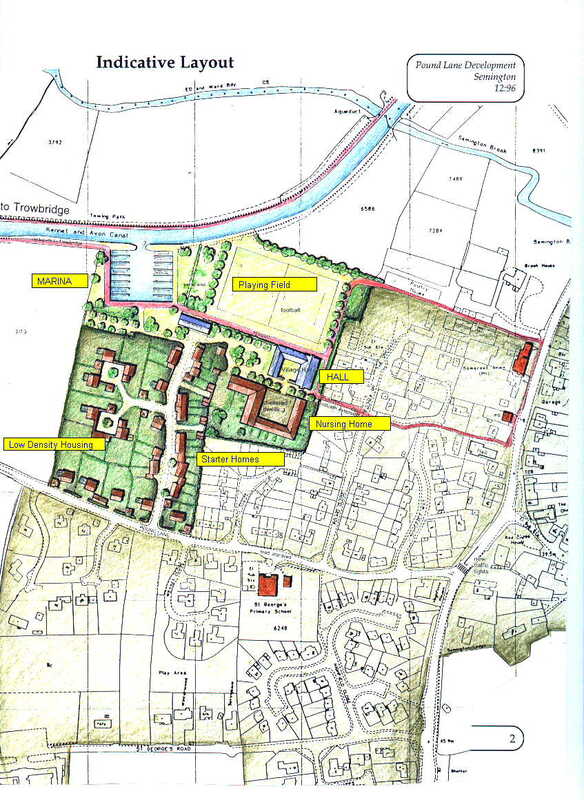 Note that the plan below shows, coloured, an indicative layout for a mixed development including residential and amenity (football pitch, marina) development. This proposal has been discussed with Semington Parish Council, and with the West Wiltshire Planning Department, but it should be understood that no application has been made. It is anticipated that the site of an existing village hall (on the High Street) would be traded in return for the provision of the new village hall shown in this layout. A By-Pass has recently been opened for Semington village.